Tuesday, April 24, 1888 Very pleasant still, but cooler. 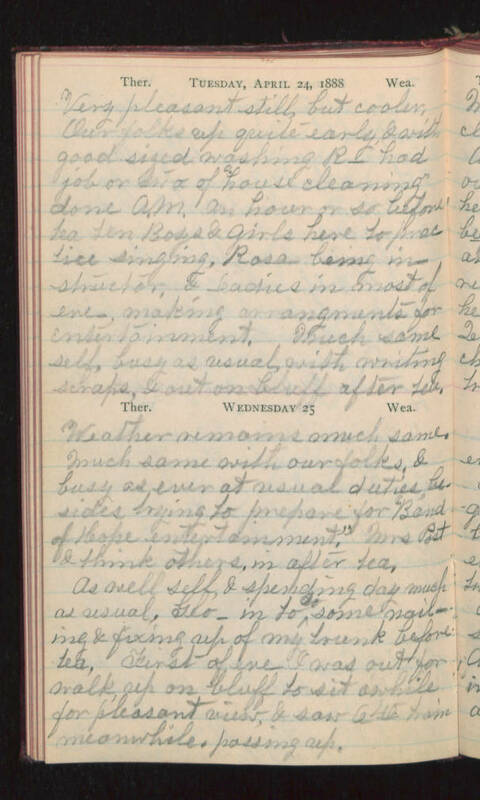 Our folks up quite early, & with good sized washing R- had job or (illegible) of "house cleaning" done A.M. An hour or so before tea ten Boys & girls here to practice singing, Rosa- being instructor, & ladies in most of eve, making arrangements for entertainment. Much same self, busy as usual, with writing scraps, & out on bluff after tea. Wednesday 25 Weather remains much same. Much same with our folks, & busy as ever at usual duties, besides trying to prepare for "Band of Hope entertainment", Mrs Post & think others, in after tea. As well self, & spending day much as usual. Geo - in to do some nailing & fixing up of my trunk before tea. First of eve I was out for walk, up on bluff to sit awhile for pleasant view, & saw 640 train meanwhile, passing up.